I don't remember what it was that launched my recent search for a great English muffin recipe. 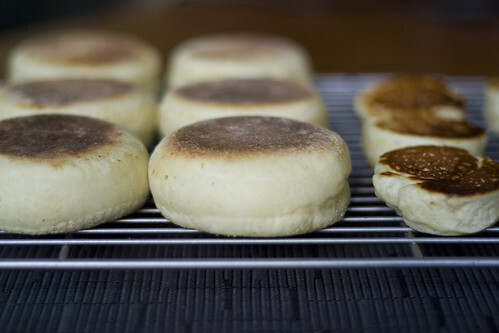 I like English muffins, or "Eng muffs" as we referred to them when I was a child, but I haven't eaten (let alone bought) them in years. They are not exactly an obsession of mine. Yet something in the last couple of weeks put English muffins into my head, which tapped into eight or nine years' worth of English muffin deprivation, and suddenly I desperately wanted an English muffin. Of course, it wasn't good enough simply to go out to the store and buy some, I had to make them. And so my quest for the perfect homemade English muffin was born. To be honest, I still haven't found it. I've tried three different recipes, and each one was inadequate in some way (or many ways). The first, well, perhaps the less said the better--even though it came from a trusted source. The second came from another fairly trusted source, Alton Brown, but the muffins came out small and lackluster, and hardened substantially only a few hours out of the skillet. The flavor was acceptable, though, and the recipe did have one thing going for it: the muffins had great nooks and crannies. Enter the third recipe, and my current favorite, from Bernard Clayton's New Complete Book of Breads. That's it up on the left there; the ones on the right are the results of Alton Brown's recipe. I ask you: which would you rather toast and spread with butter and jam (or sandwich around an egg, or a piece of cheese) for your first meal of the day? 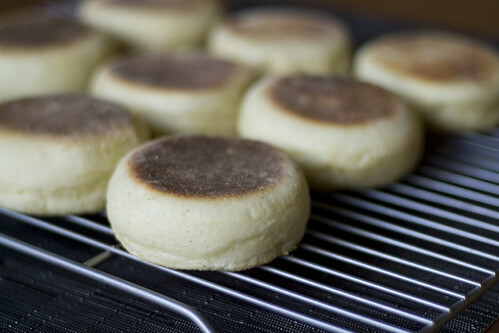 Still, for all that they might look like beautiful English muffins, they aren't perfect: despite being delightful in almost every way, they lack nooks and crannies. Split open (with a fork, as they should be), the interior texture resembles that of a torn loaf of bread-- soft, moist, delicious bread, but ordinary bread nonetheless--more than the nooked and crannied English muffins I know from my childhood. I have a notion in my head of what ought to produce a good English muffin: a hearty dough, using an egg or two for richness and bread flour for substance; rolled out on a cornmeal-dusted surface and cut to shape; and cooked in a pan to give a lovely, browned crust on top and bottom, with light, pillowy sides that yield nicely to a fork or fingers. Clayton's recipe has all of this, but the result is still not quite right. 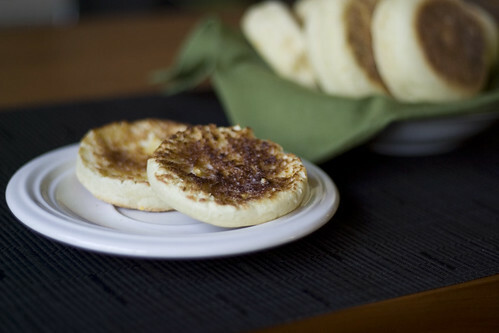 I read somewhere in the Interwebs that an English muffin requires a softer, scoopable dough, almost a batter, in order to achieve proper nooks and crannies. Yet I don't see how a batter could ever achieve the kind of mouth feel that a dough made with bread flour possesses. So, here I am with my almost-but-not-quite-perfect recipe. I am not entirely satisfied, and I will keep looking (and baking). All in all, though, this is actually a very good recipe, so I'll post it below the fold. It doesn't have the hoped-for nooks and crannies, but it toasts up beautifully and takes butter nicely, so I suppose my complaints are only aesthetic. And it really is satisfying to plop little rounds of dough down onto a skillet (cast iron or otherwise) and watch them puff up and brown into beautiful little muffins. I haven't been this excited about breakfast in months. Combine 3 cups of the flour and the other dry ingredients in a large bowl, or the bowl of an electric mixer, and stir to blend. Mix the butter with the hot water, and stir until the butter has melted. Pour the mixture into the dry ingredients. If you are using an electric mixer, attach the mixer's flat beater and beat for 2 minutes. If you are mixing by hand, grab your favorite wooden spoon and beat for 150 strokes, resting as necessary to keep your arm from falling off. Gradually stir in the remaining flour by 1/4-cupfuls, stopping when you have a rough, shaggy mass of dough. If you are using a mixer, remove the flat beater and change to the dough hook. Keep mixing; the dough should clean the sides of the bowl nicely and move in a ball with the hook. If you are working with your hands, turn the dough out onto a clean, floured surface and knead until the dough is smooth and elastic. Clayton says it should feel "alive under your hands." Add sprinkles of flour as necessary to keep the dough from sticking, and knead for 10 minutes. Place the dough in a large, lightly greased bowl, and turn to coat. Cover the bowl with plastic wrap and let the dough rise at room temperature until doubled in size, approximately 1 hour. When the dough has risen, punch it down and then knead it for about 30 seconds. Let it rest for another 10 minutes. Meanwhile, clean the work surface and sprinkle it with cornmeal. Turn the dough out onto it, and roll the dough out to 1/4-inch thick. If it resists rolling and shrinks back, allow it to rest for a couple of minutes before continuing. Use a 3-inch cookie or biscuit cutter to cut the dough into rounds. Sprinkle the work surface once again with cornmeal. Cover the rounds of dough with a clean towel, and allow them to rise until they are doubled in height, about 45 minutes. There are three ways to cook these muffins: electric griddle, old-fashioned stovetop skillet, and oven. If using an electric griddle, heat it to 325F/165C. If using a skillet, I found that using my cast iron skillet on medium and low heat worked best. If using an oven, preheat it to 420F/215C. 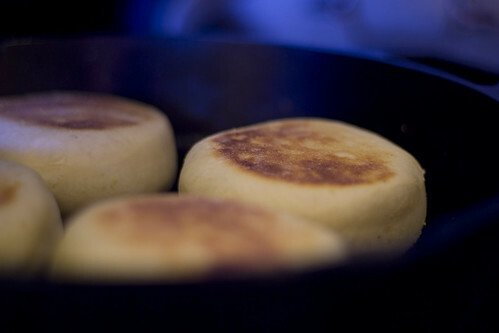 On the stovetop (griddle or skillet): cook the muffins for 2 minutes per side. You do not want them to cook too quickly, so avoid the hottest part of the cooking surface, and rotate them if necessary to ensure even browning. Reduce the heat and cook for a further 6 minutes per side. Be careful not to scorch them. In the oven: bake the muffins on a sheet pan for 6 or 7 minutes, then turn them over and bake for another 8-9 minutes for 15 minutes total. Let the muffins cool on a rack before toasting. The muffins freeze well for a few months.